Despite their stolen conversations and tantalizing glances in the ballroom, Luke and Joanna know that their stations in life are just too different. But when this Cinderella governess's life is transformed and their roles are reversed, will they risk everything to be together? 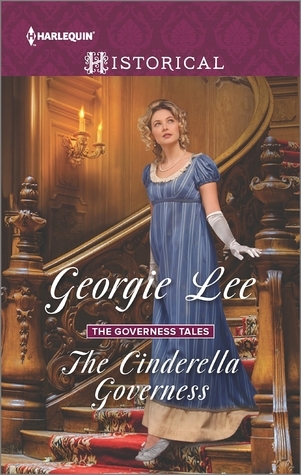 When I saw the title, I was thinking it was going to be more a "rags to riches" kind of story than one that left me thinking it was more an attempt at giving the Cinderella story a regency twist. To begin with, I felt as though the author took the "Cinderella" vibe a little too far by giving Joanna the employer equivalent of a wicked stepmother and wicked step-sister. In fact the first time we meet the oldest daughter Frances, she is angry with Joanna for interrupting her tryst with someone (never mind the fact Joanna was in the room before Frances and her admirer come in). Added to that, the first time Luke and Joanna set eyes on each other is a ball where Joanna is dressed much nicer than she should have been considering her position. That aside, this story had its moments. I enjoyed Luke's character the most out of all of them. He came home from war to do his duty to his family, but once home began to work towards bettering the lives of his soldiers families. He was one of the few people who didn't overlook Joanna due to her station in life, and who actively sought out her company. The attraction between them was undeniable, and I enjoyed watching the romance also bloom. However - the constant back and forth between 'we will make this work', to 'we can't be friends' was almost enough to give the reader whiplash. I understand a romance given the difference in their stations was something that was just not done, but this was more than that. Just when it would seem as though these two were able to get their happily ever after (especially when Joanna's true heritage was revealed), the author would throw another twist into the story continuing to drag it out. To be honest, as much as I did enjoy the author's writing style - I was glad when this one finally ended. Overall, I believe this story may still appeal to those who enjoy historical novels. I enjoyed the author's writing style enough that I would give them another chance.